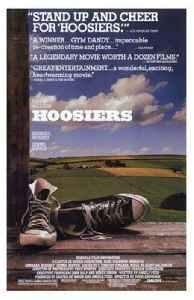 Hoosiers is a 1986 sports film written by Angelo Pizzo and directed by David Anspaugh in his feature directorial debut. It tells the story of a small-town Indiana high school basketball team that wins the state championship. It is loosely based on the Milan High School team that won the 1954 state championship.